There's nothing quite like the perfect white rice at Chinese restaurants. The secret? 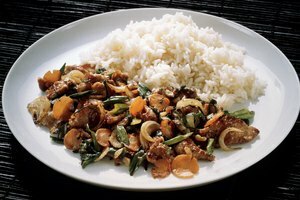 Jasmine rice. Rinse the rice once or twice in the saucepan, then strain. Let the rice to come to a gentle boil, uncovered. Once boiling reduce to low heat, and cover. Cook for 15 minutes. Turn off the heat and let the rice sit for at least 5 minutes. Fluff with a fork and enjoy. No need to stir the rice. Never leave the room when cooking rice over the stove. Keep an eye on it. 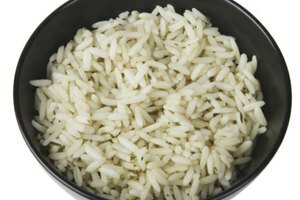 Rice can go from perfect to dried out and overdone in minutes. Invest in a rice cooker to get perfect rice every time.